I thought I’d note the ‘native’ way you can mount the BMPCC4K to the Ronin-S.
You can simply offset the supplied Ronin-S riser plate which will allow the camera to fit onto the included Manfrotto style mounting plate. I don’t use this method myself as I like to be able to hot swap / quickly remove the camera for battery changes, tripod mounting, etc. The solution I’ve finally settled on is to use an RC4 quick release plate adaptor which is large enough to provide clearance. 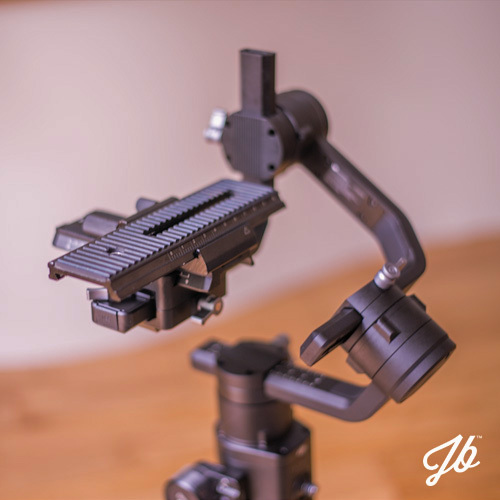 Now I’ve got my hands on a Ronin-S it quickly became clear that there is no easy way to flip the orientation of the tilt arm as suggested in this article. 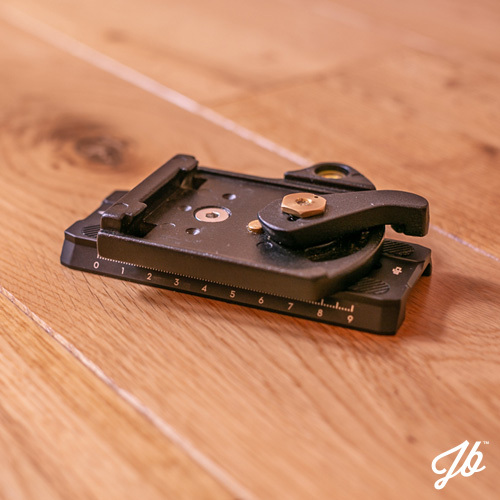 The arms are locked in place, so without dissembling the latch mechanism on the roll motor, it’s not happening. No drama, there will be numerous ways to attach the wider BMPCC4K to the Ronin-S. The solution I’ve come up with is to fit this £10 Fotomate Macro Focus Slider Plate which will provide plenty of room for the camera. Balancing this setup should be fine. 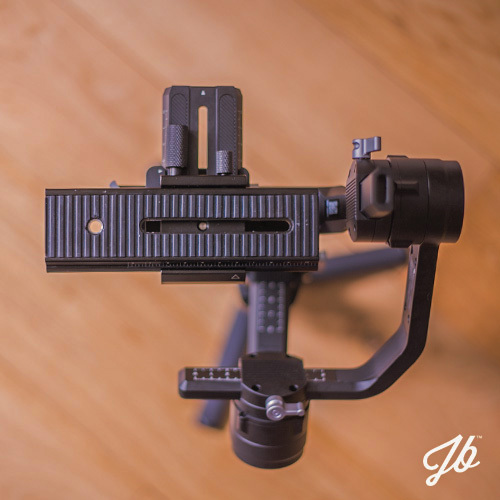 These slider plates are horizontally adjustable, which is useful to get the camera as close to the tilt motor as possible. If required, a counterweight could be always be added underneath. One of the hottest bits of news from NAB 2018 was the surprise Blackmagic Pocket Cinema Camera 4K reveal. This camera packs some outstanding features for the price. Already teased at CES, the DJI Ronin-S handheld gimbal series is another exciting product. Given DJI’s proven track record for motion control systems, the latest version, shown at NAB, has been further tweaked based on beta testing feedback. Pairing these new filmmaking tools will make a powerful system for self-shooters and the like. The overall width of the Blackmagic Pocket Cinema Camera 4K is wider than most cameras in this class. At 178.1mm / 7″ it really is a wide boy and will require deep pockets, well, physically speaking! Compared to the current Blackmagic Pocket Cinema Camera, it’s apx. 51mm / 2″ wider. And 26mm / 1″ wider than a Canon 5D Mk.3 shown on the Ronin-S product page. Keen to see how this may work, I’ve done some calculations and accurately mocked-up the setup*. The good news is it will fit, providing the Ronin-S is setup with its tilt motor on the left. This will allow the Pocket Cinema Camera 4K to fit with plenty of room between the left of its body and roll axis motor. Adjustments can be made to the handle’s position which will aid balancing. As you can see from the second mockup below, it appears that the camera will not physically fit with the tilt motor on the right due to; the camera’s tripod mounting point clearance and the gimbal being at, or close to, its max position. 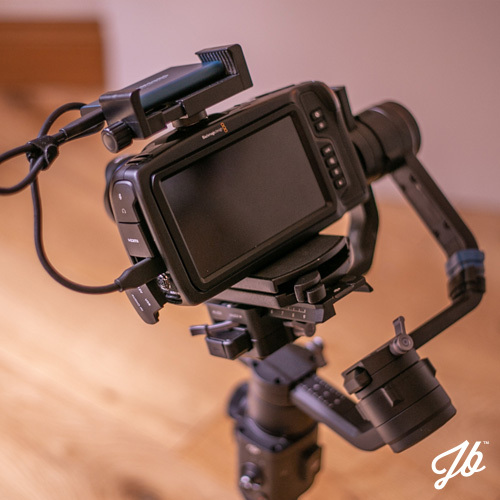 With the obstruction free roll axis on the Ronin-S allowing full view of the Blackmagic Pocket Cinema Camera 4K’s beautiful 5″ screen, this image gives you a feel of just how awesome this setup will be! *Please note: All calculations / mockups are based on; the DJI Ronin-S website image (DSLR version) with its pictured Canon 5D Mk.3; and dimensions provided by Blackmagic Design. These are speculative mockups but product specifications can always change. Sensor 18.96mm x 10mm (Four Thirds). Rumoured to be the SONY IMX294CJK. 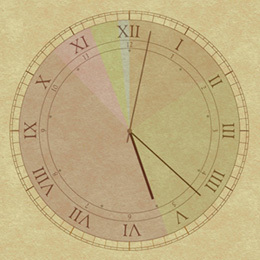 Frame Rates Project frame rates of 23.98, 24, 25, 29.97, 30, 50, 59.94 and 60 fps supported. Codecs CinemaDNG RAW, CinemaDNG RAW 3:1, CinemaDNG RAW 4:1, ProRes 422 HQ QuickTime, ProRes 422 QuickTime, ProRes 422 LT QuickTime, ProRes 422 Proxy QuickTime. Not sure why you wasted your time with this. 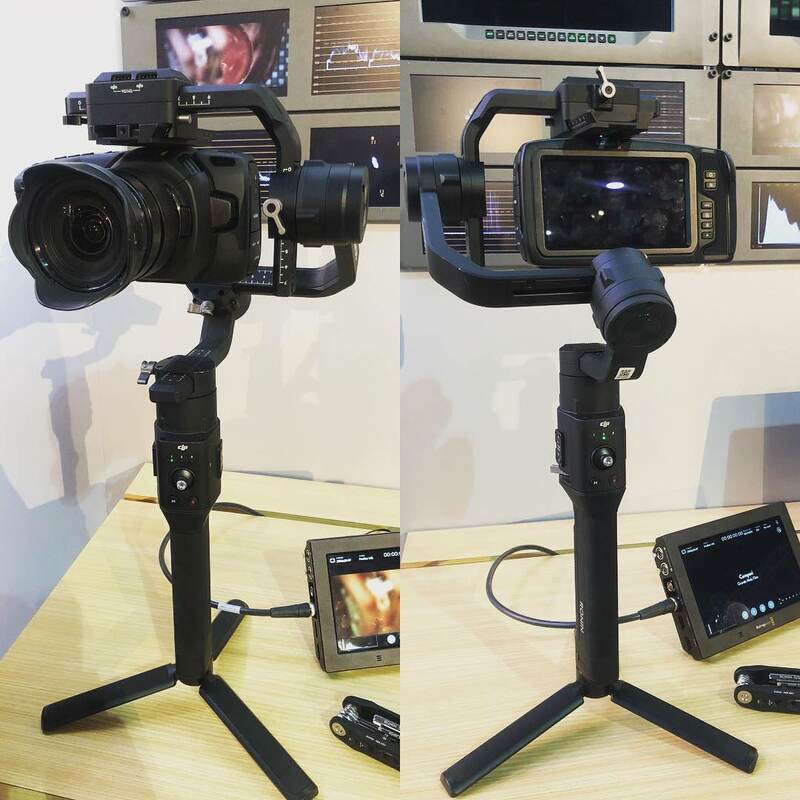 There’s already pictures of the Ronin S being paired with the Pocket 4K at NAB. I didn’t consider it a waste of time. 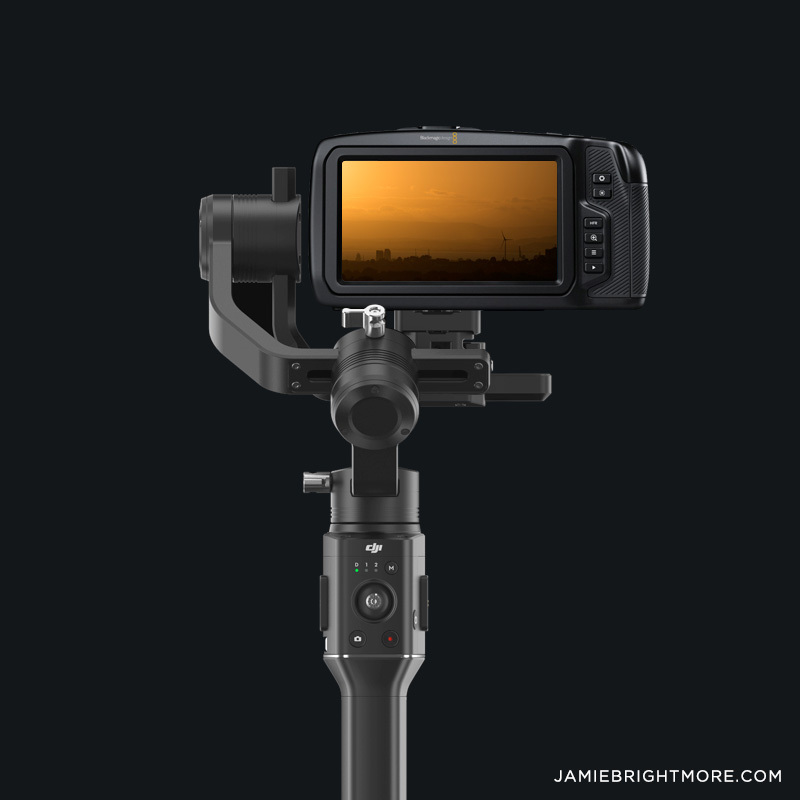 Interested to see your source, the only pictures I saw (after I wrote this) were of the camera attached to the gimbal hanging by the hot shoe mount, which partially obstructed the screen. Yeah, big waste of time. I want a refund. John, There are better ways of making comments without the negative conutations. People can be so rude these days, cowardly without feelings. I have searched everywhere for this information. 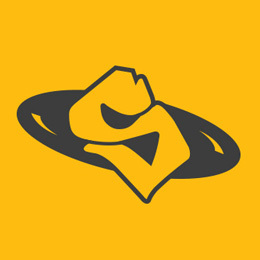 There is regarding other models, but not the s. Thanks for spending your time in providing. Great info my friend. Thanks for taking the time to create this content for us. I definitely found this useful bro. Would you happen to know if the ronin s is compatible with the original Blackmagic Cinema Camera 2.5k ef mount? Yeah, the 2.5K will work easily. This is cool, and will be an awesome setup. Was trying to find info about whether you could align the motor to the left and it seems you can based one what you have here. I have a hand strap I want to keep on my camera, so we will see how it goes. Thanks for your work on this. Quite an unexpected flip! :D I’d rather have it the way it’s show in this article and something tells me it will be possible by the time Blackmagic release their camera. Stanly, Thanks so much, this is great. This is why we should always keep asking questions, someone most likely has the answer. Do you guys think this cam will be controllable with the Ronin-S in the future? Blackmagic are spot on with their software and already have developer API’s for controlling the URSA Mini. As I understand it, the BMPCC 4K uses the same software as the URSA Mini. So as long as DJI are up for it, it should be a breeze to sort out. That’s great to hear! I have ordered both the BMPCC 4K and the Ronin-S.
Just updated this article (up top) guys. 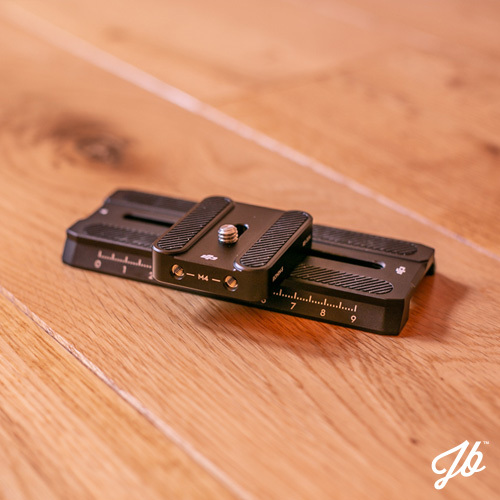 will it be mandatory to use the Photomate Macro Focus Slider Plate? No it’s not mandatory buddy, this is just a suggestion of one way to attach the camera. There will no doubt be other options, but it needs something as the camera is just too wide to mount naturally (that’s what she said). hahaha I have Ronin S… im waiting for BMCC 4K.. here we go. Do you think the follow focus wheel on the Ronin with pull focus on the BMCC4K? 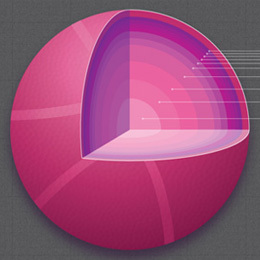 Meaning native MFT lenses (non-manual) will be more likely to work. 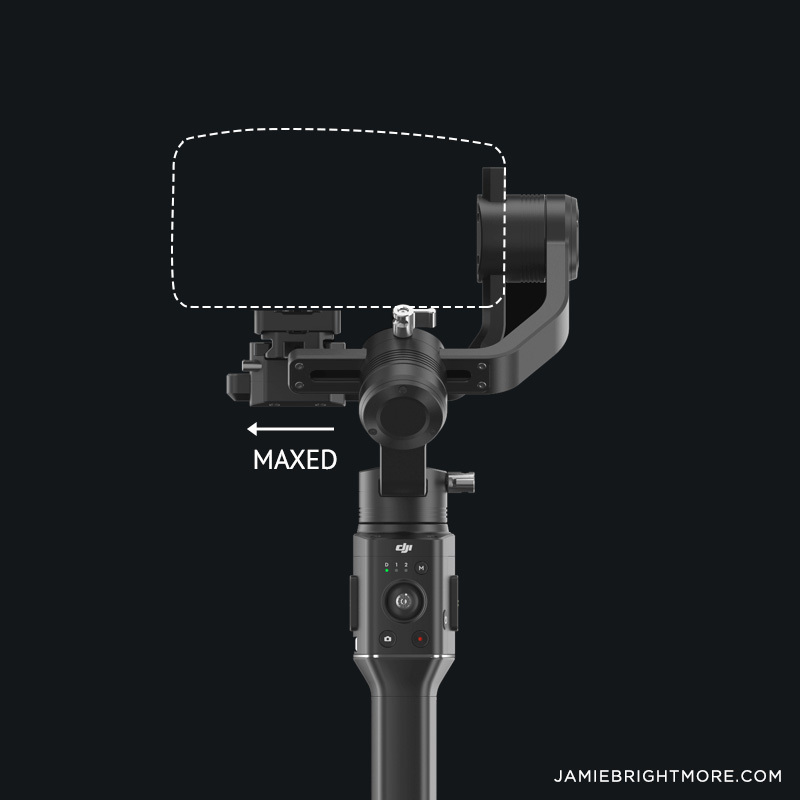 Do you know if the Ronin S and Blackmagic pocket camera 4k will be compatible for accessing the gimbal app. Right now it does not show Blackmagic as on the compatibility list. If you mean camera control from the gimbal (rec start/stop, focus pull, etc.) I’m sure as soon as DJI get a Pocket 4k production unit they will do all they can to support it. Yes, I wasn’t sure if it was the camera system or the lens that has to be specific. Anyhow, great, I appreciate it! Nobody mentioning one of the biggest “cons” of the assembled package Blackmagic Pocket Cinema Camera 4K+Ronin-S: the Cam is positioned in a way that she is very far from the Ronin-S axis so that all 360 degree spins are not round but elliptical. Not only the BPCC but mainly all lenses of cams to be installed on the Ronin-S are not aligned to the Ronin axis. I didn’t even think about that. Good point for sure. The way I have my A7Sii set up is off center too. Likely not as extreme as the Pocket 4K will be, but I’ve not noticed the footage looking abnormal when rolling 360º and tracking forward. This is very promising for me, because I have the Kinefinity Terra 4K, and I can’t seem to find any info online about whether the motor can be oriented on the left. People are saying the camera with it’s side grip can’t be balanced on the Ronin S, but I feel like it could if the orientation could be changed. What do you think? Were you able to get this setup working? Cheers! I mentioned in an update above that the only way to reverse the orientation of the tilt arm would be to disassemble the unit, but I doubt that would work as the software would be at sixes-and-sevens when operating or calibrating. How are you finding the Terra 4K? Have you found a way to power the Pocket 4K from the Ronin S battery? You could buy one of these https://bit.ly/2ElVo3c chop the dc plug off and solder on a female Weipu connector (which the P4K uses). Should work fine. Hi. Great site and knowledge you got. What is that plate you use to mount the Samsung SSD? I have a Moza Air 2 with a Metabones and Sigma 35. Cheers. It’s just a cheap, slightly modified, phone holder. Search Amazon for ‘Ailun Phone Holder’.